Ask fellow campers about "Nelson County Park" and nearby attractions. Please note: this review is for the Yellow Smoke Park, part of the county park system - I did not see anything specific f0r that park for Denison. The park is very scenic, with a small pond. Quite wooded, so we couldn't get satellite TV, but there were a couple stations we could pull in via the powered antenna. The Verizon signal was weak, but made adequate with a booster. The sites have water and electric (not all), and the water was not close to the site. There is a sewer dump on the way out of the park. Self-register after selecting a site. We would definitely stay here again. We camped at Nelson County Park in a Motorhome. Denison is nearby (a couple miles) - we were visiting family there, so this county park was convenient. The park is used by local folks for recreation, so sites can be hard to come by on weekends and holidays. (no reservations) We are not fans of smokey campfires... and seemed to be the only ones who felt that way. Quiet mid-week, much more activity on the weekends. Nice small county park with a small lake, fishing, and sand beach. There are 2 RV camping areas. The lower CG has a few good-sized back-ins facing the lake (we stayed in one of these), across from the boat ramp. You continue up the hill to the larger upper CG where most of the sites are, along with the bathrooms, showers and dump station. We were here right when the park opened for the season, CG nearly empty. It was very quiet, except on Sunday when a large group used the picnic area across the road. The county conservation officer/caretaker was very nice and helpful. They were still doing some spring cleanup, but the park was in very good condition. $15 electric sites, $12 non-electric, no reservations. I imagine it gets busy on summer weekends. 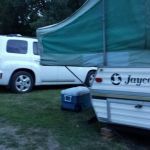 We camped at Nelson County Park in a Motorhome. Are you affiliated with Nelson County Park ?